Something that's barely mentioned (and usually not at all) in all the talk in recent months about how the Israelis ought to whack the Iranian nuclear facilities, just in case they've got a nuclear weapons program cooking, ought to be obvious in the map (via Wikipedia) above. The Atlantic ran a number of maps showing target areas, on the heels of a New York Times article about possible strike scenarios. The Atlantic only reprints a quote that any Israeli aircraft would need to cross "more than 1,000 miles across unfriendly airspace." The Times article mentions that the "most direct" route would need to overfly both Jordan and Iraq, stating that after the December withdrawal, the US "no longer has the obligation to defend Iraqi skies." Of course, the US has effectively controlled most of Iraqi airspace since the Gulf War more than twenty years ago and it's had total control for nearly a decade. The US would need to turn a blind eye to any Israeli overflight in a way they surely would not if, say Syrian or Iranian jets flew into Iraqi airspace. Particularly if the operations would require "at least 100 planes" for bombing and refuel tanker protection. US air defenses in Iraq would look pretty incompetent if they claimed they didn't notice something like that going on overhead. Thirty years ago, the Israelis were able to pull off a strike on a nuclear reactor near Baghdad, overflying Saudi Arabia just south of the Jordanian border. 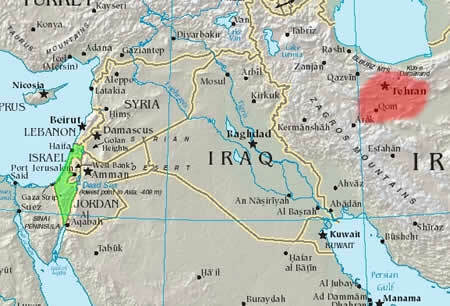 As the map shows, though, even if they were able to get away with the same type of southern route, they'd still need to cross part of Iraq or the Persian Gulf, again fairly well-surveilled by US air patrols and radar. To the north, of course, there's Syria and (again) Iraq or Turkey. The real question would be, I think, would anyone try to take on Israeli planes crossing their territory? At the very least, in addition to the US ignoring their attack, Israel would need to be sure that Jordan and/or Saudi Arabia had no plans to hinder operations. Saudi Arabia doesn't exactly have any love for the Iranians but o massive overflight of Israeli planes might not be a particularly popular political move. People might start to wonder what all the jets and other military hardware the Saudis keep buying are for if not to enforce the soverignty of their soil. It seems unlikely that Syria would let Israeli planes fly unharassed, even if it was unable to completely prevent them from doing so. Which puts things back in the US camp. All of the foaming at the mouth about how Israel is champing at the bit to launch an attack on Iranian sites comes down to whether the US is going to go along with it. There's no way the US armed services can maintain credibility that they would have no knowledge of a sizable strike through most of the possible attack corridor. Everything south of the Turkish border to the Straits of Hormuz has been watched over by US land-, air-, or sea-based radar systems for two decades. The US isn't likely to attack Israeli jets flying over Baghdad on their way to strike zones in Iran, but not telling them to back off in the same manner they would another country's planes. Failure to do so will undoubtedly lead to charges of co-ordination between the US and Israel in any attack and extend any retribution to American-related targets. Iranians are likely to remember that the USS Vincennes managed to shoot down an Iranian airliner�thinking it was an Iranian F-14�even though it was in Iranian airspace when it was supposedly acting aggressively.